Takatsuki TA-300B tubes. World Finest. OK, enough screwing around with 300B tubes. We now carry the World's Finest 300B tubes made today. Breathtaking not only for their magical sonics but for the amazing longevity. 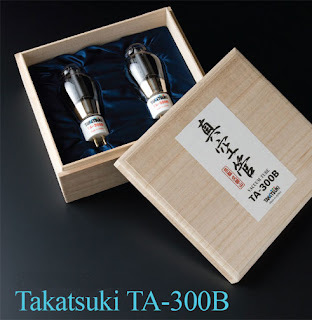 The famous Takatsuki 300B tubes are now in our store. They have been near impossible to find. We have them. Yes, they are pricey. However, they are the best and they last for a very, very long time. Reviewers love them. Audiophiles are crazy about them. Your ears deserve them. Click Here to get a pair now or find out more.